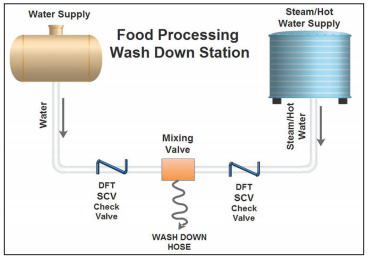 Challenge: Within the Food Processing Industry in the Midwest, there were numerous instances of companies requesting assistance in their wash down stations. These food plants include beef, pork and chicken processor companies where the processing areas must be sanitized using very hot water at 165 degrees F or higher. The stations might or might not use a nozzle delivering the water through a hose. There are strict temperature regulations for the decontamination of processing areas within these applications. Often there are no reliable check valves installed around the mixing valve, which has been proven unreliable because it allows the cold water supply to enter the hot water supply system during periods of non use. During these non-use periods the water migrates, causing the hot side of the system to lose temperature. Migration over the weekends can really develop low temperature problems. When temperature is not correct the operators turn up the heat which puts them at risk for scalding. 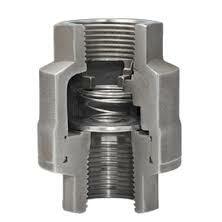 Solution: The DFT® model SCV® Check Valve was used to meet safety needs and criteria. This is not a new application for the BSS model as they have been used in this application dating back to the 1950’s & 60’s. DFT® has proven to be the valve that holds up for long periods of time and eliminates the hot to cold-water migration problem.